Skin look better? A healthy digestive system? Now these benefits are possible and through the use of specific enzymes! 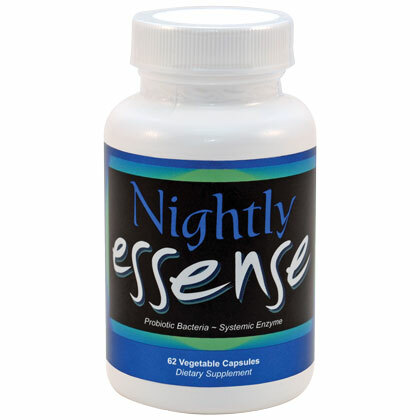 Nightly Essense contains keywords that have shown support a wide range of systems and promote cardiovascular, immune and digestive enzymes health. • Production of specifically vitamin B2, B5, B6, B12, folic acid, biotin and niacin. • Reduced lactose intolerance by the enzyme lactase. • defense against food poisoning. • Inhibition of Candida, yeasts and other forms of fungus. • Healthy look and feel of the skin. • Better absorption of food because the enzymes they produce. • paristalsis Increase (contraction wave that carries food through the colon). • Increased immunity through the secretion of acids and natural antibiotics. • To help maintain good hormonal balance.